If you are tired of Geoponics (growing plants in a normal soil) or want to experiment something new, growing plants in water can be a fun project. Growing plants without soil (in a soilless medium or an aquatic-based environment) is called hydroculture. The plants get nutrients through in water containing dissolved nutrients. Do Plants really need Soil? Before answering that questing, let’s figure out why plants need soil? or what does soil provide to plants? So we can say that soil just acts as a medium to provide plants support, water, and nutrient. Soil can be replaced until plants get their support, water, and nutrients. By choosing not to use soil, you are also protecting your plants from common diseases, and pests. The information provided here is beneficial to gardening enthusiasts who want to try hydroponics as a hobby. The commercial production of food utilizing hydro-culture techniques is complicated. It demands competency in farming and business. Aquaponics is an innovative method in which plants absorb the fish waste as nutrients and recycle the water for the fish. This system creates a symbiotic relationship in which fish provide nutrients to plants and water is conserved as you don’t need to change the water for fish. Aquaponics is integrated with micro-farming to form Microponics. You can start your aquaponics system with these small betta aquariums with plants on top. Aquascaping is a method to grow aquatic plants generally for the purpose of decorating the aquarium and arranging them with rocks, stones, or driftwood, in an aesthetically pleasing manner. In this method, you are limited to aquatic plants only that are submerged totally under water. Usually, Aquarium housing different fish are aquascape with the plants, although it is possible to create an aquascape with plants only. Water Garden is also an example of Aquascaping. Hydroponics is a type of hydroculture to growing terrestrial plants without soil by using mineral nutrient solutions in a water solvent. The plants are supported by an inert medium, such as perlite or grave with only their roots exposed to the mineral solution. Read more about six types of hydroponics and how they work here. If you want to start asap, check these awesome hydroponics kits to grow herbs indoors. Aeroponics is an advanced type of hydroponics, but we have mentioned it exclusively here because it is very different from other types. Plants are grown in an air or mist environment without the use of soil or an aggregate medium. Unlike aquaponics or hydroponics, aeroponics is conducted without a growing medium. and proper aeration of the water solution. There are many kinds of containers that might be used – a cement trough, glass jars, earthenware crocks, metal containers, or fiberglass tank. The container must be leak proof. Metal and concrete containers should be painted inside with asphalt emulsion to prevent corrosion and toxicity to the plants. Fiberglass is more resistant to corrosion than the other materials. Glass containers should be painted dark on the outside to keep sunlight from making chemical changes in the solution and to prevent the growth of algae. Leave an unpainted narrow strip down the side so the level of the solution can be checked. Plants are supported in two ways. In water culture, plants are grown with roots submerged in a nutrient solution, with the stem and upper parts of the plants held above the solution. A “platform” for planting into and supporting the plants as they grow will be needed. This is sometimes called the “litter bearer.” It is often made of chicken wire or hardware cloth (wire) base on which is placed about three inches of wood shavings, excelsior or a similar material called litter. The metal wire should be constructed to fit across the top of the container and should be plastic covered or painted with asphalt-based paint. The platform and supporting material need to be porous to allow for aeration. Styrofoam has also been suggested as a means of stabilizing the plants above the solution. Plants are inserted into holes in the floating styrofoam. Holes should be large enough to avoid constriction of stems at maturity. Cotton or other material may be used as shims in the holes around the stems. Punch holes at random in the styrofoam to allow for better aeration. The tops of heavy or cumbersome plants need to be further supported by trellising. 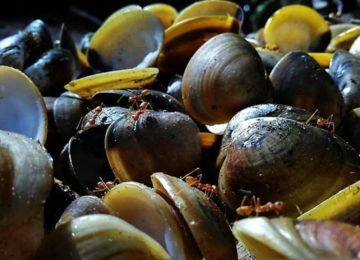 This can simply be grouped as “soilless” culture, which would include sand culture, gravel culture, and culture utilizing other soil substitutes such as sawdust, wood shavings, and vermiculite. In these type of system, Crops are grown in shallow tanks or troughs that serve as the container for the gravel. The gravel, sand or other aggregates are used much as the soil is used in conventional plantings—to provide anchorage and support for the plants. Scattered dry on the surface and watered into the root zone. Whenever it is to be applied from the bottom, fairly coarse materials such as gravel should be used so that the medium will flood and drain easily. Sand usually is not coarse enough for bottom feeding but works well with top feeding. 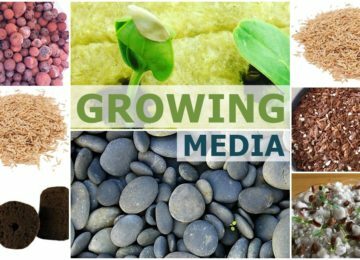 There are many types of growing media you can use like sand, vermiculite, rice hulls, redwood bark, pine bark, peat moss, perlite, and Rockwool. Check the full list of growing media with their pros and cons here. Here is the full guide to choosing a Growing Media. Hydroponics need the large concentration of nutrients for plants. These minerals have to come from somewhere – usually a mine. In hydroponics, there is no one ideal nutrient solution. Any good solution will contain all of the essential elemental nutrients needed for plant growth. The sources and amounts of these nutrients will vary from one suggested solution to another but are commonly available as commercial fertilizer and chemically-pure salts. Along with the many formulas suggested, there is a variety of ready to use solutions on the market. Most all of these combinations give fair to excellent results when used as directed and are suggested for hydroponic hobbyists. These mixes are easily dissolved in water for a proper nutrient solution. The organic hydroponics supplement or entirely replace the inorganic compounds with organic fertilizers. The commonly used organic material includes guano, blood meal, bone waste, fish meal, wood waste, manure and plants residue. In Aquaponics, Fish supplies the nutrients to the plants. Plants, in return, clean the water for fish. 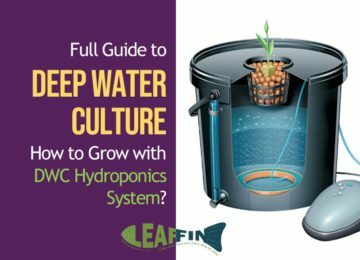 This approach makes hydro culture more sustainable and organic, potentially replacing the need for mining. With any solution, the composition changes as the plants grow and utilize the nutrients. Therefore, care and attention must be given to controlling the content, either by additions of certain ingredients as needed or by changing the solution completely from time to time. Since frequent testing is necessary to determine which nutrients have gotten out of balance, it is easier to change the solution. As the plants grow in the prepared mix, it is necessary to add more nutrients from time to time. Again, any one of several preparations could be utilized satisfactorily for this purpose, but one of the easiest to prepare solutions results from the use of commercially available soluble fertilizer. Two suggested solutions for weekly feedings are made with 20-20-20 analysis fertilizer at 1 pound per 100 gallons and 25-5-20 at 1 pound per 100 gallons. A suggested schedule for their use would be to use the 20-20-20 for the first three weeks, followed by 25-5-20 the rest of the way. Where tomatoes are the primary crop, substitute 2 pounds of calcium nitrate (per 100 gallons water) for the complete fertilizer. This should be done about every two weeks to ensure adequate calcium and reduce blossom-end rot. Various techniques might be used to apply the solution the plants. This depends whether you’re using media based system or water culture system. For larger troughs and in media based, a pump is often used to fill the trough to within an inch of the top. When the pump is shut off, the liquid solution drains back into the supply tank, leaving the aggregate medium moist. A time clock may be used to start and stop the pump at selected intervals. In a small setup, the nutrient solution can be mixed in small containers and added as needed. At the beginning, the container is filled with the solution almost to the level of the litter. Then, at predetermined intervals, the old solution is thrown out and the new solution added. The frequency and number of changes of the solution will depend on the size of the plants, how fast they are growing, and the size of the container. Just as a starting point for beginners, solution changes might be made at weekly intervals for the first few weeks, then twice weekly for older plants. Should the water level get too low between changes, add only water until time to change solutions. Lack of oxygen in the water and resulting growth impairment may occur unless air is pumped through the solution with a pump, compressed air or other equipment. Bubbles should be spaced ½ to 1 inch apart as they rise through the solution. Aerators normally used to keep fish alive in bait wells or aquariums are suitable for small units. In a water-culture system, Leave about one inch of air space between the litter and the solution. As plants grow, allow 2 or 3 inches of airspace below the litter. Moreover, Adjustment of the acidity or alkalinity (measured as pH) of the water may be necessary to keep it within an adequate plant growing a range of pH 6.0–6.5. This means testing with indicator paper and adding sulfuric acid, if needed, to lower pH or an alkaline material such as sodium hydroxide to raise pH. Have any question? Feel free to ask in the comments. You can share your own experiences that may add value to information and knowledge of others. & if you have any friends who want to know more, please share this article with them. Thanks for reading.